This is the best creamy tomato basil soup recipe you will ever make. It is easy, fresh, and simple! This soup is not complicated to make and it sure does taste good. In total, it takes about 25 minutes to prepare. Not everything we cook has to be complicated to taste good. Sometimes the simplest meals made in the kitchen are the best dishes. 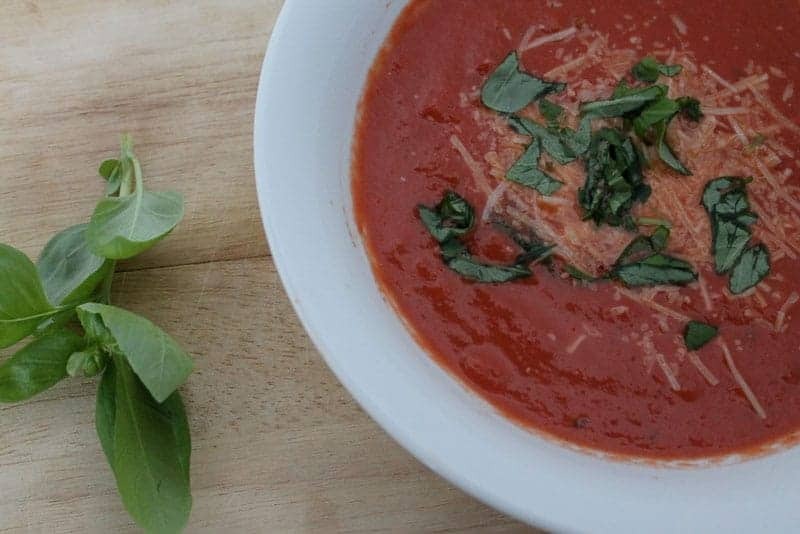 I promise you that this Tomato Basil Soup recipe is absolutely delicious; even kid approved. People will assume you spent hours in the kitchen and the dirty little secret is that in less than 30 minutes you will have a soup your taste buds will thank you for. You can serve it as a “First Course” at a fancy dinner party or as an entree for a healthy meal. Either way, it is “umm, umm good.” I promise! Now when you glance over at the recipe ingredients and you see the little words “fennel seed,” don’t let that throw you off. This is my surprise ingredient that makes this tomato soup recipe the “best creamy tomato basil soup recipe.” There is something about that soft crunch that brings out the other flavors in this soup. Where several other tomato soup recipes are bland, the fennel seeds in this recipe bring out a gentle surprise burst of flavor that compliments the tomato, garlic, and basil. Fennel Seeds have many health benefits. They carry numerous anti-oxidants that help prevent cancer, aging, infection, and degenerative neurological diseases. They are known to lower your LDL cholesterol levels and are also a great source for fiber. Fennel Seeds have a high concentration of important minerals that help control and regulate your heart rate and blood pressure. Combined with the nutrients found in the tomatoes, garlic, basil, and onion in this recipe; this soup “does a body good.” So eat up! Go for seconds. *Cooking Note: I am a HUGE FAN of the POMI chopped tomatoes. The cheaper tomato cans just don’t compare.Their tomatoes taste fresh out of the garden. It comes in a box with 26 oz. You would use 2 boxes in substitution for the 3 cans of tomatoes. However, they do not sell Pomi in every store. If you don’t use Pomi, use a high-quality tomato brand. Tomatoes are the main ingredient. You really want a good brand to make this dish POP! 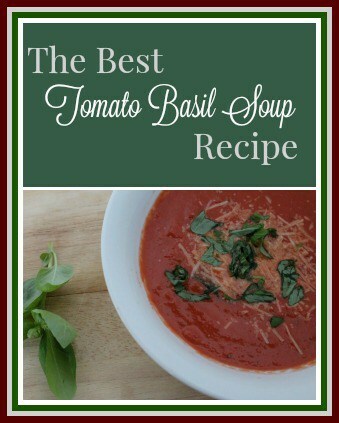 Did you enjoy this best creamy tomato basil soup recipe? For more healthy, easy, delicious soup options, check out these recipes: Carrot Ginger Soup, Gazpacho, and Zucchini Curry Soup. In a large sauce pan, sauté onion with butter until almost translucent. Add garlic. Cook one minute being careful not to burn. Add the crushed tomatoes. Add the whole tomatoes one at a time, squeezing them into the pan to break them up. Add all the juice from the whole tomatoes. Add the stock, salt, honey, balsamic vinegar, fennel seed, and crushed red pepper. Cook for 10 minutes at a simmer on medium heat. Slowly add in cream and fresh basil. Cook for about 5 additional minutes stirring slowly. Salt and pepper to taste. To serve, garnish with freshly grated parmesan cheese and chopped basil. Enjoy! * Cooking Note: Do not skimp out on the tomatoes. Use high quality canned tomatoes. The tomatoes are the key ingredient, so it is worth the extra expense. Cook the onions until they are soft. You don't want crunchy onions in this soup. And you MUST use FRESH Basil. No dry stuff! Fresh, fresh, fresh is the key to making your mouth happy. Hi Katie, I am so making this this weekend!! I freaking love soup & this looks so good!! Did you get any part of that blizzard?